The sad but true reality is that the stock market and the typical investment strategies are stacked against the average person. The big corporations and financial institutions have leveraged their influence to create systems that give them a massive advantage in terms of inside information AND technologies that allow them to make trades before you even get the chance. 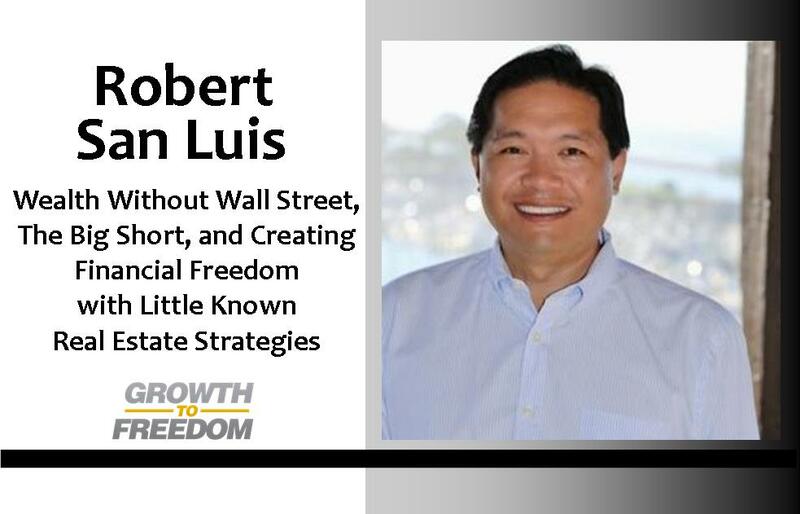 Robert San Luis has studied the investment industry at length and has discovered proven methods of getting your money OUT of the speculative, risky realm of Wall Street, and into investments that cash flow monthly and provide you the recession proof security you want and deserve. [0:31] What to expect in this great episode with Dan’s guest Robert San Luis. [2:15] Why “What’s your number?” is the absolutely wrong question. [4:52] How the stock market and investments are rigged so that YOU are not the winner. [6:10] How to examine your strategy for retirement. [8:10] Who is Robert San Luis? Why did he get into this specializes sort of knowledge? [10:50] What Robert was known for in High School. [13:30] How can the average person compete against the Wall Street Machine? [18:18] What can listeners do to move themselves forward wisely in the investment realm? [20:06] How Robert became interested in helping people with financial issues. [23:55] What would it be like to find low-risk cash flow opportunities that were recession proof. [29:21] Getting started investing in commercial mobile home parks and properties. [32:15] The lowest point Robert’s business career and what he learned from it. [34:10] Who Robert turns to for advice in life and business. [34:15] The importance of psychology surrounding money.